For me, a good trouser can withstand an entire day sitting down and moving around and still maintains its shape. Something that feels like a lounge pant but comes across as a professional, polished trouser. Three options come to mind: this one ($248), this one ($335) and this one ($98 and 40% off right now = $60!). These are my absolute favorites when it comes to ankle trousers. I wish I could wear long wide leg trousers more often, but I love the versatility of an ankle pant because it allows to to change from heels to flats seamlessly. Happy Friday and thank you so much for stopping by!! Hope you have a wonderful weekend. You always find the best trousers! The fit on this one is perfect! Always love ♥️your classy and sophisticated looks! Trousers are my new favorite too <3 🙂 And yes, I agree – finding a pair that works well for sitting and walking around in is the best! Love this look so much, especially that coat! 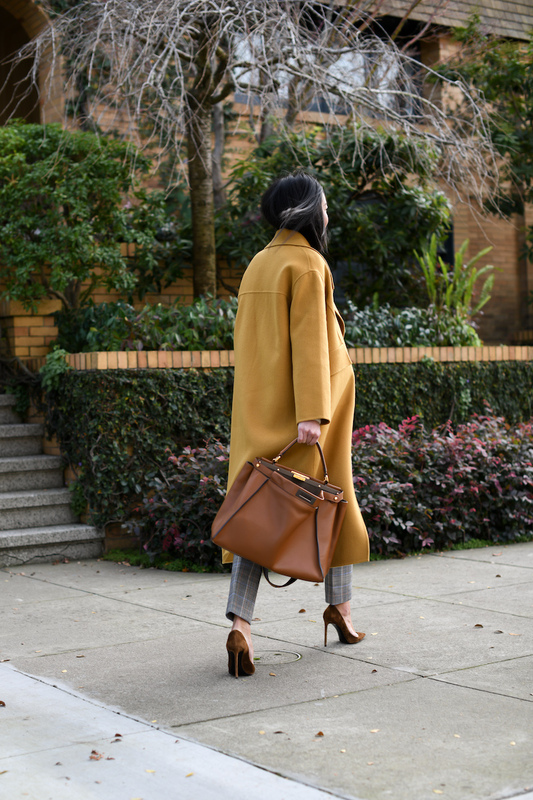 I love how the color of the coat complements the neutrals in your outfit. Love these! The tailored fit is everything! I love how you styled this look! I love keeping up with your posts!